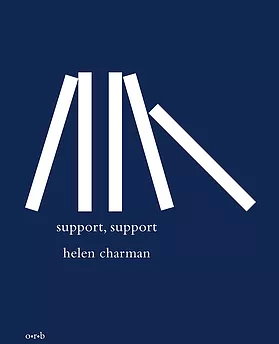 ‘love other women / collaborate only with them’ writes Helen Charman in ‘Instructions for waking up in the morning’, the first poem of support, support (Offord Road Books). The pamphlet takes its title from Denise Riley’s ‘Affections Must Not’, and women’s voices – urgent, ebullient, sardonic – are important throughout. The opening poem acts as an aphorism for the pamphlet, and for life as a woman. Indeed, aphoristic lines appear in multiple poems, and they are seriously meant, but they are also fun – a joyous expression of being a woman: ‘Women and girls rule / my world!’ (‘Prosody daddy’). The repetition of ‘heir’ makes it seem like Charman is pushing the reader towards a meaning, but we are ultimately denied clarity: who is the ‘Cream-coloured heir presumptive’? What are the speaker’s ‘eligible resources’? Here, Charman complicates meaning by turning what are almost concrete images into bizarre, unfixed terms: what does it mean to identify a child as a ‘flanking vowel’? How can a pencil lisp ‘out / southeastern’? This abstract language obscures the sense of the poem to the point where I must concede and hope it is not really meant to have a fixed meaning – perhaps it is word-association, or an attempt to capture a voice. Perhaps I’m not meant to understand at all – and there’s a joy in that, in accepting that I might not, and that Charman has created a language that’s all her own. Through this assertion, the (second?) speaker disrupts the poem and radically alters its voice with a statement of inadequacy – and of wanting someone else to recognise it. Charman is deft with her bathos: the three little words aren’t a declaration of love, but an almost-humorous declaration of hate, of having discovered the truth behind the façade. This is, I think, a political stance of wanting to see things as they are, even if that reveals a series of fundamental contradictions. cried in? At parties, or at home? The resonance of this – of being able to have complex thoughts, and thus still feeling overwhelmed by the world – is how the poems shine, how they move from the abstract to the concrete. landlord. A house is a kind of ordeal anyway: all that cleaning. The speaker seems to want and resist domesticity, and an idealised, romanticised version of her feminine self, which is both appealing and repellent. In reality, she is ‘Rosy and barefoot in the dirty city’, and leaves ‘the plates out again’. Charman’s speakers attempt to resist narratives given to women, ‘ears popping at the pressure’ of trying to move away from that which is expected of them (‘Solstice bug’). In ‘Counterfeit money’, women actively resist the tropes of femininity: ‘molar crushes petal edge and juice leaks, chew / up and spit pink hot-house flowers’ at the same time as being told to ‘Be quiet, be quiet’. This ‘pressure’ suggests that Charman is at once interrogating these narratives and expectations, and also wondering whether all the energy spent trying to resist them is better spent elsewhere. Crucially, this puzzle ends up in ‘an image of a women crashing / intentionally into the flower bed in her own / car’, and so it seems that all the complex thought is futile, and that there is no straightforward answer – only an attempt to destroy femininity in its widely understood forms with a kind of wildness that is full of delight, and an awareness of the awkwardness of being a woman. not the ideal time to revisit a classic. The poem begins with the Hollywood trope of leaving a significant other, and then unravels into culturally specific, gauche and self-deprecating humour. Perhaps the most pertinent conundrum the speakers and Charman are grappling with is how to come to terms with expectations and reality: of how to be a woman, or feminine, and wanting to disrupt that ideal, of having complex thoughts and robust political motivations, but being prone to embarrassing, unpredictable or destructive behaviour. Importantly, Charman’s pamphlet is a celebration of women and their contradictory, complex nature. Another mantra from the pamphlet, and for life: ‘Speaking / as a woman, it is necessary to be ready / for anything’. You can find out more about support, support from Offord Road Books. Nicholas Nova: Support. This image has been cropped and filtered.